Never ask a stranger for a tampon again! 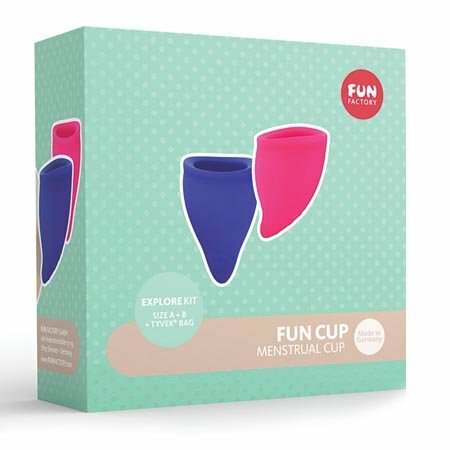 The Fun Cup provides up to 12 hours of period protection at a time. The smaller Fun Cup Size A is great for lighter days and for people who find a smaller cup to be a more comfortable fit. The larger Fun Cup Size B is great for heavier days, people who are over 30, or people who have given vaginal birth. When you're ready, just empty it, wash it out, put it back in, and enjoy another 12 hours of not thinking about your period. Won't cause dryness or micro-tears like tampons can and it will stay in place during swimming, dancing or anything else. Small holes around the cup's rim help create a reliable seal to keep it in place. Fun Cups come with an antimicrobial Tyvek bag that is discreet, gender-neutral and small enough for a purse or glove compartment. Set contains one Pink (size A) and one Dark Blue (size B).